Below is a picture postcard with an image of the Jefferson Davis County Courthouse in Prentiss, Jefferson Davis County, in the state of Mississippi, U.S.A. 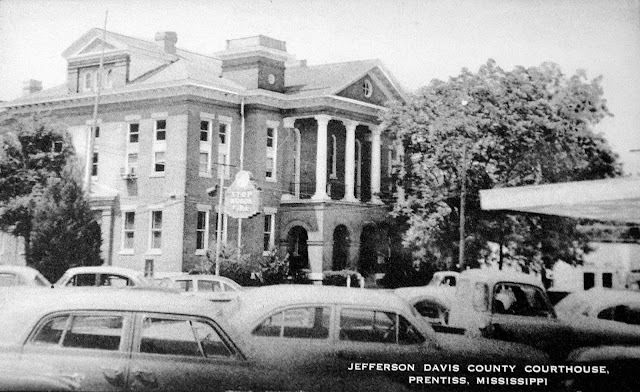 It is thought that the town of Prentiss may be named after Seargent Smith Prentiss, who was a member of the Mississippi House of representatives or possibly Prentiss Webb Berry, a local land owner. Archibald Prentice was born in c 1844 in Whitburn, West Lothian, Scotland. Alexander was the son of the Rev. Arichibald Prentice and Jane Ann Russell. James enlisted for the duration of the war in London. On the night of the 1901 census of Scotland, Alexander was living at the Newbraighall Manse, Brunstane Road,Duddingston, near Edinburgh in the Scottish county of Midlothian. Alexander's elder brother William David Russell Prentice was a living-in pupil at Fettes College, Edinburgh. Midlothian, Scotland. Alexander was living with his mother and father Archibald and Jane Anne Prentice, his sister MaryGlasgow Dymock Prentice aged nine and his brothers William David Russell Prentice and Archibald Hepburn Gardiner Prentice aged twenty three and twenty. James emmigrated to South Africa in 1905. He resided at the Johannesberg Golf Club in South Africa. James arrived at Plymouth, Devonshire, England from Capetown, South Africa on the 26th Aug 1914, on the Kildonan Castle (s ship of the Union Castle line). His occupation was given as secretary. James was a Lance Corporal in the 'B' Squadron, 3rd Dragoon Guards (Prince of Wales Own) Regiment. He entered the French theatre of war for the first time on the 4th Dec 1914. James was injured at Ypres and would have been passed through the medical chain of evacuation, untill he reached one of the Hospitals at Boulogne-sur-Mer, Pas de Calais, France. James died of woulds recieved at Ypres on the 6th Jun 1915 and was buried at Boulogne Eastern Cemetery. Boulogne, was one of the three base ports that were used extensively by Commonwealth armies on the Western Front throughout the First World War. There were extensive medical facilities available in Boulogne. William Prentis was the son of William and Sarah Prentis. He was their first born child and was born c 1699 in Dukes Place, St. James, London. His mother Sarah died c. 1708 in London when William was nine years of age. William emigrated to the Americas and arrived in Williamsburg in the early 1700's.. 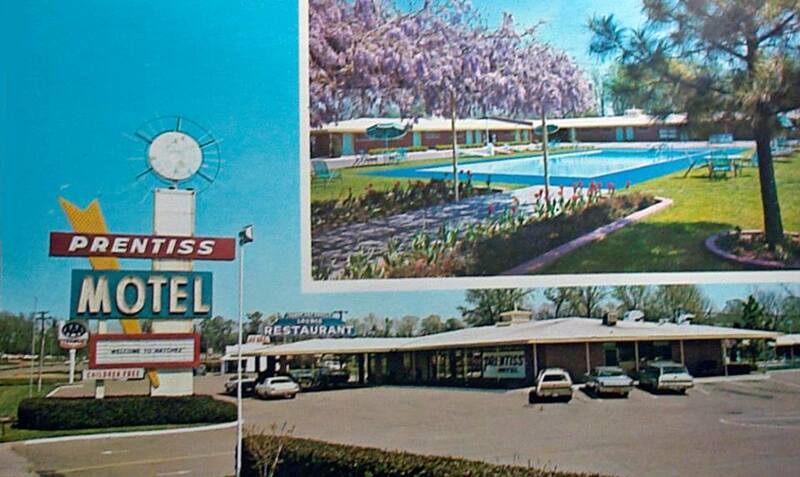 This is a photo postcard of the Prentis house. 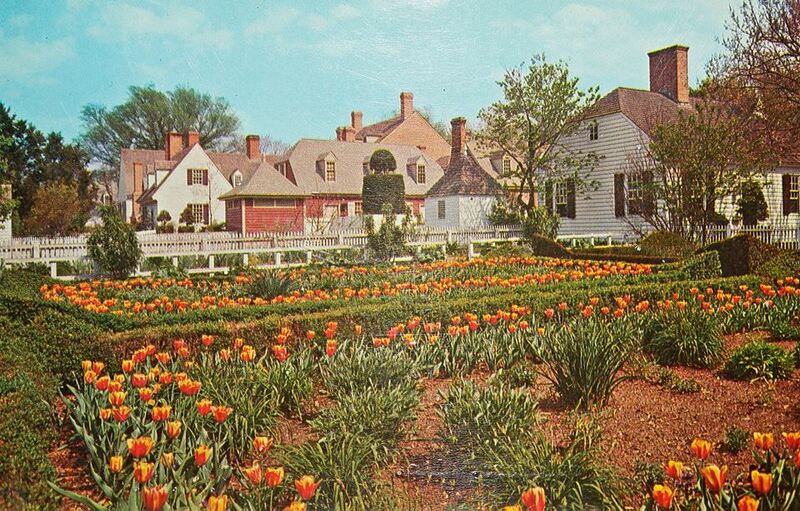 This is a photo postcard of the Prentis house gardens in Williamsburg, Virginia, U.S.A. It would appear to be a fairly modern photograph with relatively modern buildings, although there was a much earlier Prentis House at this location. 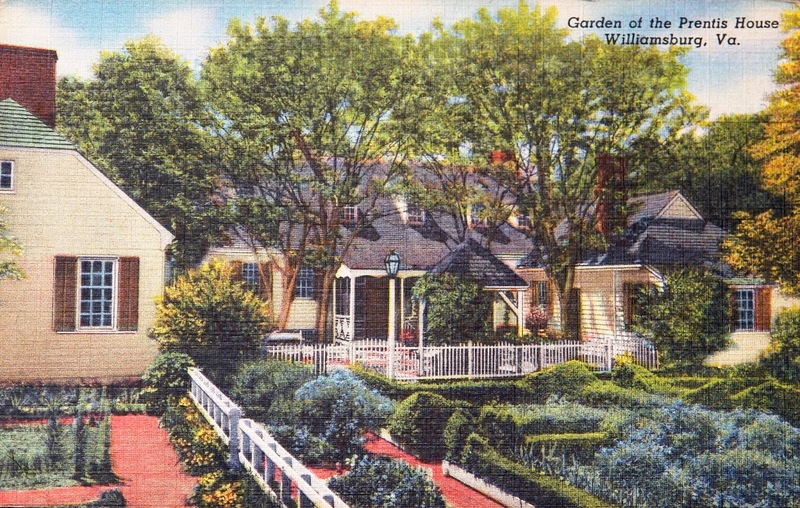 In the book, The Gardens of Colonial Williamsburg, the authors describe the origins of the earliest Prentis House in Williamsburg. ''The Prentis House at the north-east corner of Duke of Gloucester and Botetcourt Streets was the home of the family of a prosperous and influential merchant. Early York County records show that the property was purchased in 1712 by John Brooke from the Williamsburg trustees. In 1725 he sold the house to his son-in-law William Prentis. Although William Prentis was the orphaned son of a London baker, research concludes that he recieved a thorough grounding in book-keeping, accounting and penmanship at Christ's Hospital in London, before being apprenticed to Archibald Blair of Williamsburg. William Prentis and his wife Mary Brooke had six children, they were Daniel, Elizabeth, William, John, Sarah and Joseph. One of his grandsons, John B Prentice was a well-known slave-trader. 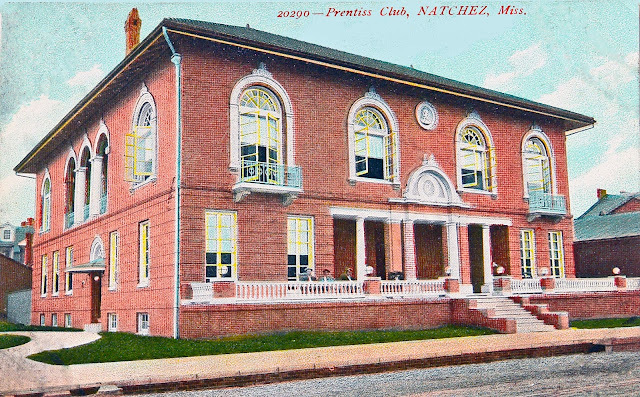 This postcard is of the Prentiss Club in Natchez, Mississippi, in the United States of America. The club was chartered in 1903 and built in 1905. I know even less about the Prentiss Motel than I do about the Prentice Club, however here is a picture of the Prentice Motel, also in Natchez, Mississippi. 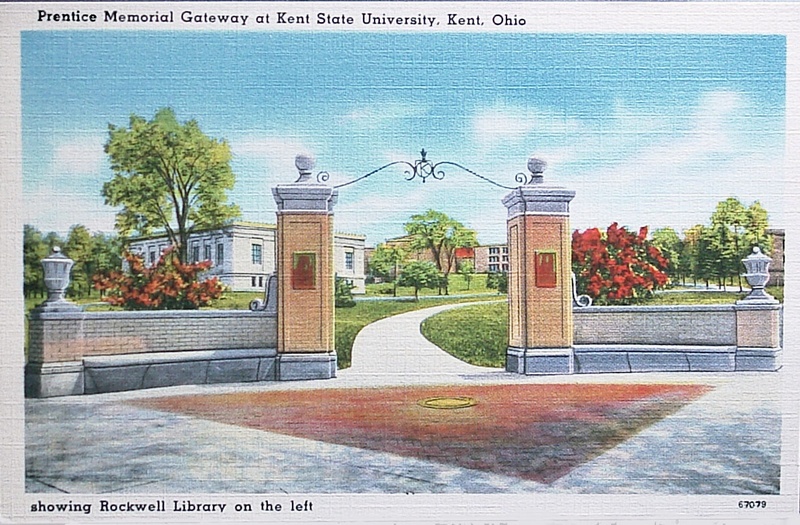 I am interested in May H Prentice and the Prentice Memorial Gateway at the Kent State University, Kent, Ohio. I believe that May was from Macomb, Illinois and was the first female faculty member, at Kent, arriving in 1912. She taught English, the History of Education and School Management. 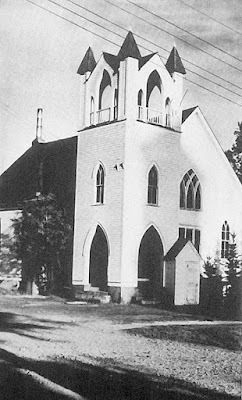 She retired from teaching in 1930 and continued to live in her house on Willow Street until her death in 1935. The Memorial Gateway was dedicated to May on the 15th Jan 1935. If there is anyone out there that knows anything about May Prentice, her family or more about her association with Kent University, I would love to hear from you. I am trying to research the history of this town. So far I have got .... Prentice village is a small village within the town of Prentice, in Price County, in the American state of Wisconsin. It appears that it was named after Alexander Prentice, who was born in Scotland and emigrated to America. In the spring of 1881, Alexander Prentice and George Greenman travelled from Portage to survey timber and a mill near current day Prentice, where the Wisconsin Central Railroad crosses the Jump River. Presumably, at this time, Alexander Prentice was working within the lumber industry. Later, in 1882, the Jump River Lumber Company was formed in Prentice and incorporated in Portage with Oscar Derrick Van Dusen as President. Officers and Advisers included Alexander Prentice. 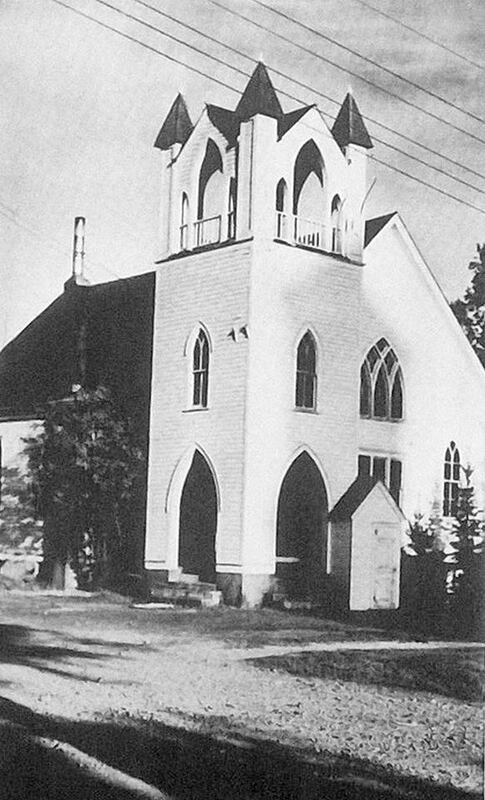 Above is the Baptist Church of Prentice, Wisconson. The post office was established in 1883 and Alexander Prentice was the first Post Master, a post which he held for six years. During the 2010 census the population of the village was 660.